Did Charlie Hebdo support Islamophobia? Some may wonder why such a question is being brought up in the light (or dark) of the Charlie Hebdo slaughters, but it is a valid question. It must be noted that even if Charlie Hebdo supported Islamophobia and lauded it as “Freedom of Speech”, that does NOT give license to fanatics to kill the supposed offenders. Still, it sheds light on the topic of “Freedom of Speech” which is always seen being trotted out when Islam and Muslims are bashed and carefully put away when other minorities are targeted. Even as our hearts are wrenched at the news of the people killed by a couple of fanatical Muslims, a glance at Charlie Hebdo’s double standards of promoting Islamophobia but crushing similar jibes at other faiths, is a worthwhile endeavor. Richard Silverstein of Tikun Olam, dug up this 2009 news item about a time when a Charlie Hebdo cartoonist suggested in a column, that the French President Sarkozy’s son (a Jew) was marrying a Jewish heiress for her money. In the news report, Charlie Hebdo demanded that the cartoonist apologize and then fired him for refusing to do so. Most non-Muslims do not see such contradictory juxtapositions, because most people’s radars seem to be set on Muslims only. The outlook of ignoring what happens to Muslims, is similar to the outlook of what happens to Blacks in America; all too often, when a Black man is being held by the Police, White people see the scene as, “Our Police is doing their job and fighting crime“, while a Black man looking at the same scene will think, “Yeah, they got themselves another n*****!“. Most non-Muslims…and unfortunately, our law enforcement agencies such as the FBI…look at Muslims being held, as another strike against terrorism, while Muslims viewing the same situation will remain convinced that another Muslim has been railroaded to burnish someone’s career. Again, nothing justifies a murderous reaction against someone who may be venting their opinions against another group, but such reactions are not the sole domain of Muslims either. The most blatant example is the 9-11 attack on the Twin Towers by 19 Muslims. Vile as the attack was, America’s reaction was and still remains, a poster example of a vile, genocidal response and America applauded. America’s response to the 9-11 attack was to destroy at least five countries (Afghanistan, Iraq, Pakistan, Somalia, Yemen) and to continue behind the scenes destruction of many more (Libya, Uganda, Kenya, Iran) that remain cloaked in secrecy. Over a million Muslims have been slaughtered, millions more have been permanently maimed and tens of millions rendered homeless even from their hovels, but America’s lust for blood has not yet been sated. However, since those are Muslims and the excuse is that we are protecting America and the “Judeo-Christian Civilzation”, none of this counts; kill even a single non-Muslim and the act gets treated as if the whole world were facing imminent destruction. Law-enforcement agencies, Politicians and other “normal” civilians keep talking about how they would love to have a dialogue with Muslims and how they would like to see us Muslims as partners and members of the same society. I for one, applaud such sentiments, but in order to get there, Muslims must also be treated as equal members of the society in which we live, not as the suspicious “other” for whom the only redemption is to repudiate their faith and join the “civilized society”. 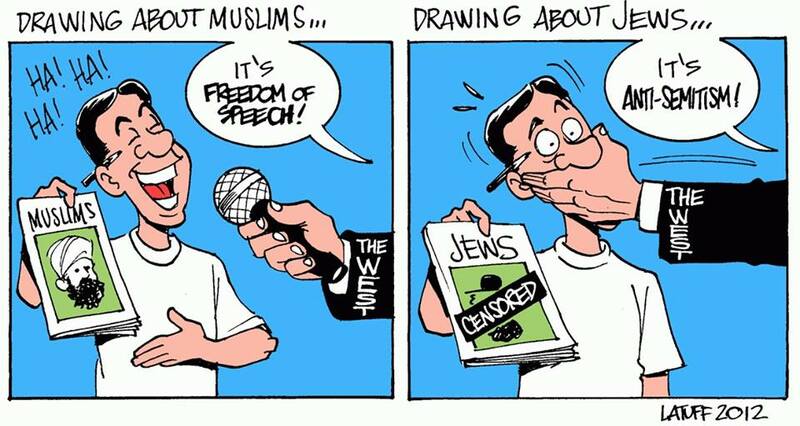 “Freedom of speech” has been used to protect all minorities. Were you an adult when the ACLU protected anti-Semitic Nazis to march in Skokie? Do you recall a few years ago when the Supreme Court protected Fred phelps’ right to picket military funerals–which he said he did because God resented the US’ toleration of homosexuals. Etc. It gets “trotted out” (now that’s not a loving phrase) for any minority under attack–and Muslims are in the cross-hairs now. People who get pissed off by sharp and intemperate speech should respond with more speech, not guns. Period. Well Phil, we agree, but I am not sure you took the time to fully read and understand my article. We agree that ANY expression, whether pleasant or not, does not deserve a violent response. The point I am trying to make is that the exercise of “Freedom of Speech” gets extra fuel when it is against Islam and Muslims and gets no support in fact, gets strong opposition, when used against another minority. Take Judaism for example, a “cartoon” portraying the prophet Moses in a stereotypical Jewish (anti-Semitic) situation, would be a career-ending move by the artist. Pictures of pedophilia would face similar reactions, as would portraying Blacks in the old classic, insulting situations. Even Charlie Hebdo, (if you had read my article) punished its journalist who snarked against a Jew. Read the article again and think a while. This is not about how to react to an insult, it is about the dual standards of society.